Kitson Arts Alliance members who greeted guests of an open house in Tunkhannock on Nov. 1 included (seated, from left) Amy Kaschak, Patrick Robinson, Betty Bryden, Ava Riley, Dan Tompkins, Betsy Green, (Standing) Gary Kaschak, Hank Fells, Diana Burridge, Gayle Ruckstuhl, and Sue Palackas. 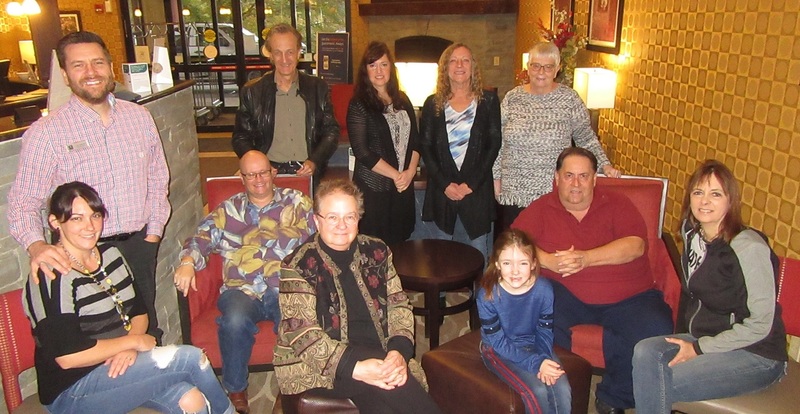 The Kitson Arts Alliance (KAA), which represents and serves most of northeastern Pennsylvania and New York’s southern tier, hosted an open house at the Comfort Inn in Tunkhannock on Thursday. Co-founder Dan Tompkins offered an overview of the organization’s accomplishments of the past year and a synopsis of plans for 2019. KAA’s biggest success in the past year has been the growth of the North Branch Art Trail (NBat), a seasonal promotion geared toward bringing attention to and getting residents and visitors on the road to visit and patronize regional artisans. The NBat guide is published four times per year to showcase events and exhibits that highlight KAA members, who range greatly from painters and photographers to traditional crafters and musicians. Secondly, the KAA has expanded its base for exhibit space, placing its members in the Dietrich Theater in Tunkhannock, the Country Cup in Towanda, and the Luzerne County Courthouse. The KAA has also expanded outreach in Susquehanna County this year. Members look forward to the return of Farmstead in 2019, as well as ongoing enhancements to the NBat guides. Each issue now contains regional reports written by members privy to their respective happenings, an enhance map and tour loop for the Nbat Trail, and two artists’ features. The most recent edition focuses on the talents of mixed media artist Sonji Lee, who creates interesting compositions from found natural objects, and John Rocklin, whose photographic focus is live musicians near and far. For more information, follow the Kitson Arts Alliance on Facebook.